April 2017 marked the beginning of a long construction season on the main downtown portion of Superior Street as the brick road was torn up and new bricks were put into place. Initially, the project was expected to be completed by the end of summer and instead faced setback after setback that affected businesses in the area. Access to the front of buildings was limited since cars could not go down the road and some of the sidewalk was under repair too. Due to problems caused by the construction, Cascarelli had to shut down nine times. The road reopened December 19, but its pristine condition has not lasted long. 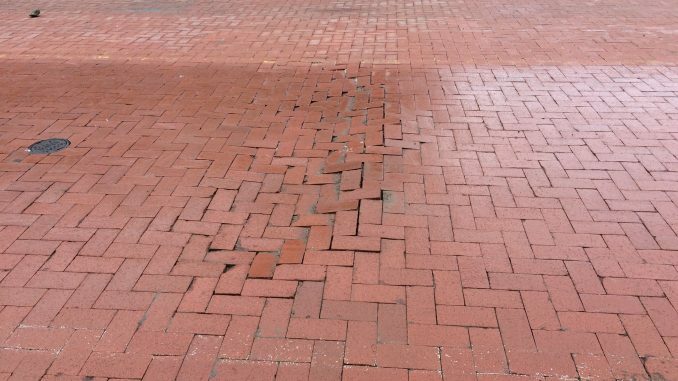 While the $4.3 million renovation did entail changes and updates to the water mains, sewage lines, the drainage system, new pavement to go beneath the bricks and a new sidewalk, the most noticeable difference of brand new bricks is where the updates have gone wrong. A little over two months after completion, the bricks are already cracking, have become raised and uneven and even have broken completely. Concerned Albion citizens are posting on an Albion focused Facebook page complaining about the damage or worrying about if the weather or semi-trucks will cause further damage. On Jan. 11, the City of Albion issued a press release stating they have been made aware of the brick’s conditions along Superior Street and that the Michigan Department of Transportation, who helped fund the construction, has been notified. They are conducting an investigation and considering options about how to handle the road. For the time being, motorists were encouraged to use different routes. Although it has been almost a month since the statement’s release, there is no plan in place yet. “I don’t have any official response yet from MDOT. They indicated that [they] may provide an update at the Feb. 20 council meeting,” said Sheryl Mitchell, Albion City Manager.